Cool picture-disc vinyl featuring the music from the original motion picture. 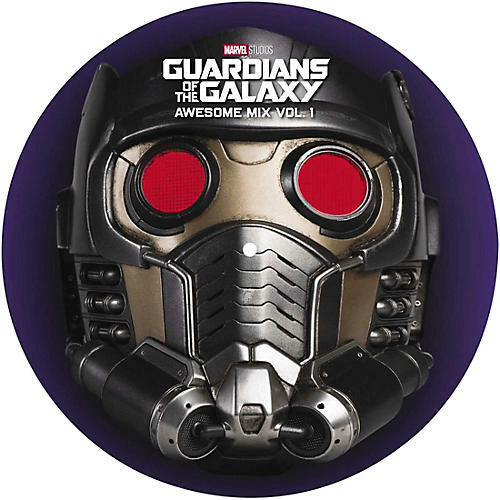 This limited picture disc vinyl LP pressing features the soundtrack to the 2014 film starring Chris Pratt, Zoe Saldana, John C. Reilly, as well as the voices of Vin Diesel and Bradley Cooper. In the far reaches of space, an American pilot named Peter Quill finds himself the object of a manhunt after stealing an orb coveted by the villainous Ronan. In order to evade Ronan, Quill is forced into an uneasy truce with a group of misfits, including Gamora, Rocket, Drax the Destroyer, and Groot. LP 1 contains the Awesome Mix, '70s & '80s songs that appear in the film as part of a mixtape in the character Quill's Walkman, which acts as a way for him to stay connected to the Earth, home and family he lost. It includes Blue Swede's "Hooked on a Feeling," David Bowie's "Moonage Daydream," 10cc's "I'm Not in Love," the Jackson 5's "I Want You Back," Redbone's "Come and Get Your Love," and The Runaways' "Cherry Bomb" and more.